With President Truman, a Democrat in the White House in 1951, Democrats tended to be more supportive of VOA and Republicans tended to to more critical, but the bipartisan consensus in Congress was that the management of the Voice of America needed reforms and that VOA programming must become more relevant to the people living without freedom behind the iron and bamboo curtains. By 1951, VOA was already moving in the direction of more political reporting and commentary about the threat of Soviet and Chinese communism, but such content, with a few minor exceptions, was not yet reflected in the Voice of America January-February 1951 Program Schedules brochure which included feature articles about George Washington and Abraham Lincoln. 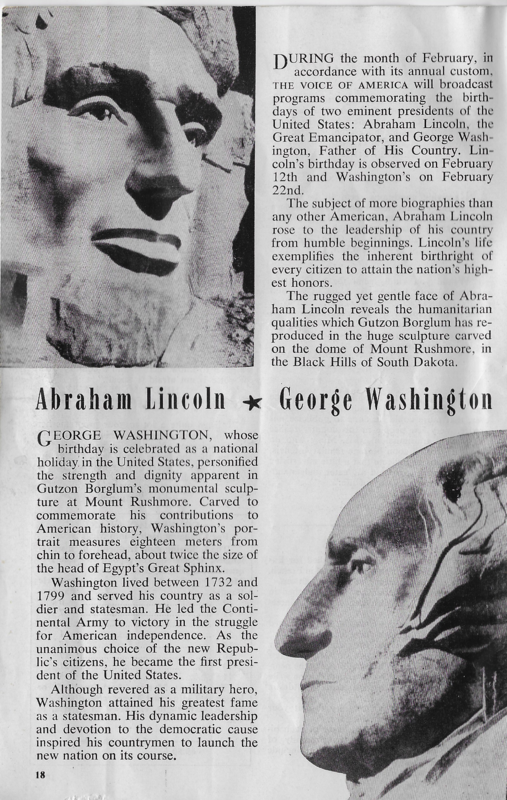 Two of the seven feature articles in the January-February 1951 VOA brochure were about George Washington and Abraham Lincoln, most likely because Washington’s Birthday, called Presidents’ Day since 1971, is celebrated in the United States on the third Monday in February. Abraham Lincoln’s birthday is also in February. 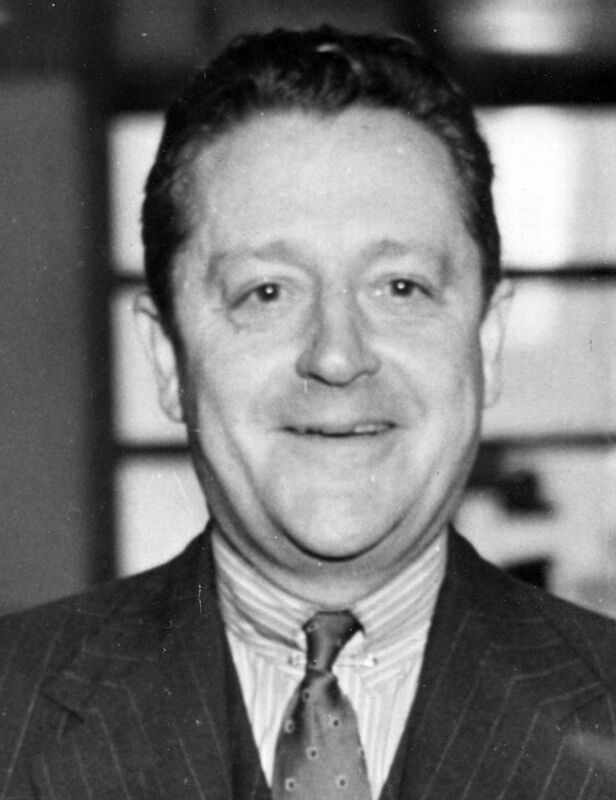 Ambassador Lane wrote that he did not object to U.S. sponsored radio broadcasting to reach the countries behind the iron curtain if appropriate material is used which will bring hope instead of intensifying despair. “But the wisdom of statesmanship, not that of salesmanship, is a requisite,” he observed. 4 His advice is just as relevant now as it was in the late 1940s. 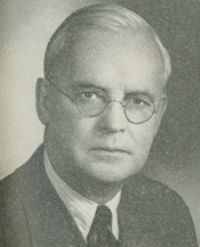 During debates in Congress in 1951 on the budget for VOA and State Department’s public diplomacy programs, a longtime critic of the Voice of America, Congressman Richard B. Wigglesworth (R-MA) disclosed that listeners to VOA broadcasts in Poland described them as “uninteresting, drab, bureaucratic in tone, unconvincing,” the same kind of criticism as that voiced by Ambassador Lane. Congressmen Wigglesworth’s and Beamer’s criticism of VOA was partially disputed by Polish-American members of Congress, Alfred D. Sieminski (D-NJ) and Clement J. Zablocki (D-WI). They both said they were interviewed by VOA and concluded that VOA programs were effective. VOA officials had discovered that interviewing members of Congress tended to blunt their criticism. But not everyone was persuaded by PR efforts of State Department and VOA personnel. Another Polish-American member of Congress, Thaddeus M. Machrowicz, a Democrat from Michigan, joined Republicans in criticizing VOA broadcasts despite being interviewed earlier by VOA. 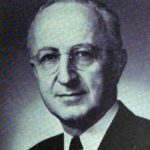 It should be noted that the term “propaganda,” as used then by Congressman Machrowicz and other members of Congress, did not have the same negative connotations in 1951 that it has now. 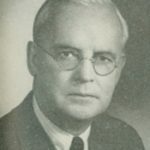 CONGRESSMAN THADDEUS M. MACHROWICZ: I have made an attempt to learn more of the workings of that organization and have even participated in several broadcasts to Poland and its people. 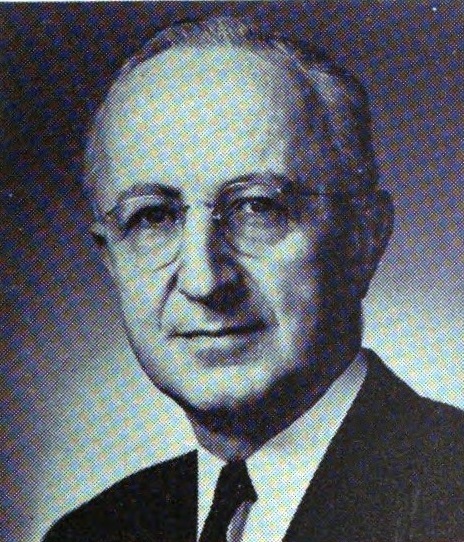 Congressman Machrowicz, most Republicans and almost all Democrats in the U.S. Congress in 1951 did not want to abolish the Voice of America but were demanding better performance and effectiveness, better management, and more accountability. 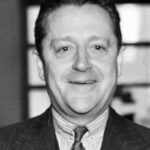 CONGRESSMAN THADDEUS M. MACHROWICZ: I cannot, however, agree with the logic of the gentleman from Ohio [Mr. BROWN], who proposes to do with this bill what he and his party have succeeded doing last week to the Defense Production Act, namely, to destroy the Voice of America, not directly, but indirectly by emaciating amendments. State Department staffers in charge of public relations responded this kind of criticism by pointing to some of VOA’s few programs about events behind the iron curtain based in part on information gleaned from monitoring communist broadcasts. At the same time, in their attempt to appeal to conservative lawmakers approving VOA’s budgets, they also highlighted VOA religious programs, even though in reality these broadcasts were also not particularly frequent or lengthy. 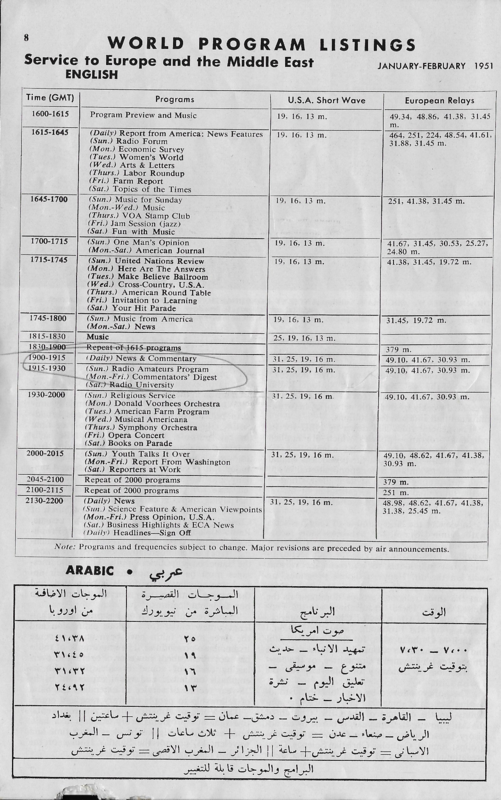 The 1951 VOA Program Schedule for VOA English shortwave radio service to Europe and the Middle East showed a remarkably high proportion of music programs of various genres, including “Symphony Orchestra,” “Opera Concert” and a 15-minute “Jam Session” (jazz). The Voice of America “Jazz Hour” hosted by Willis Conover which later became popular in the Soviet Union in other Soviet block countries did not start until January 1955. 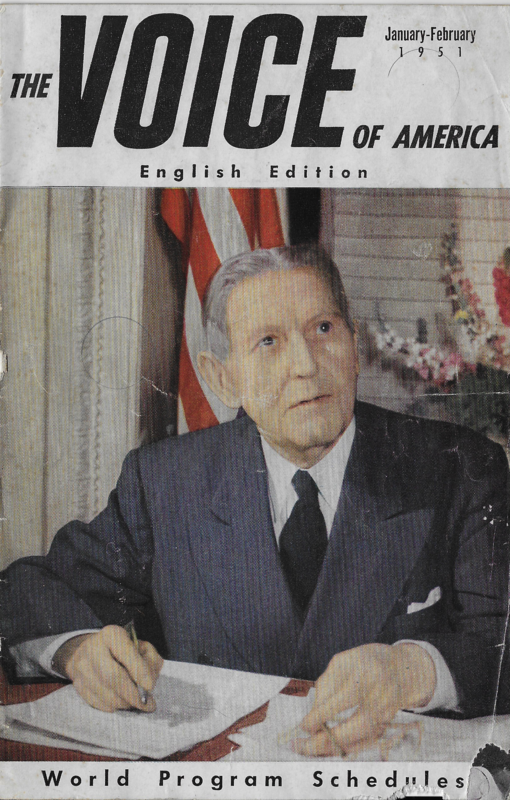 The 1951 VOA program Schedules brochure was free of almost any political content. An article on the history of religious radio broadcasting had references to freedom of religion in the United States but no information or comments on any persecution of religion in communist countries. While it was not political propaganda per se against any particular country or regime, some of the articles in the 1951 VOA brochure could be perceived by more discerning readers as rather unsophisticated propaganda in favor of democracy. That is about as close as the Voice of America came to countering Soviet propaganda in 1951, but due to pressure from Congress and American public opinion, as well as competition from newly-established Radio Free Europe, changes in VOA programming were already being made and would be fully implemented later in the 1950s. GEORGE WASHINGTON whose birthday is celebrated as a national holiday in the United States, personiﬁed the strength and dignity apparent in Gutzon Borglum’s monumental sculpture at Mount Rushmore. Carved to commemorate his contributions to American history, Washington’s portrait measures eighteen meters from chin to forehead, about twice the size of the head of Egypt’s Great Sphinx. Washington lived between 1732 and 1799 and served his country as a soldier and statesman. He led the Continental Army to victory in the struggle for American independence. As the unanimous choice of the new Republic’s citizens, he became the ﬁrst president of the United States. Although revered as a military hero, Washington attained his greatest fame as a statesman. His dynamic leadership and devotion to the democratic cause inspired his countrymen to launch the new nation on its course. DURING the month of February, in accordance with its annual custom. THE VOICE OF AMERICA will broadcast programs commemorating the birthdays of two eminent presidents of the United States: Abraham Lincoln, the Great Emancipator, and George Washington, Father of His Country. Lincoln’s birthday is observed on February 12th and Washington’s on February 22nd. The subject of more biographies than any other American, Abraham Lincoln rose to the leadership of his country from humble beginnings. Lincoln’s life exempliﬁes the inherent birthright of every citizen to attain the nation‘s highest honors. The rugged yet gentle face of Abraham Lincoln reveals the humanitarian qualities which Gutzon Borglum has reproduced in the huge sculpture carved on the dome of Mount Rushmore, in the Black Hills of South Dakota.